I love to photograph newborns and babies at home where everything they need is on hand. These sessions are all about capturing all those tiny details you never want to forget as well as documenting the love and connection between family members and your new arrival along with all the little quirks which make your family life unique. I welcome the involvement of older siblings and like to spend a bit of time with them before I even lay eyes on the baby. 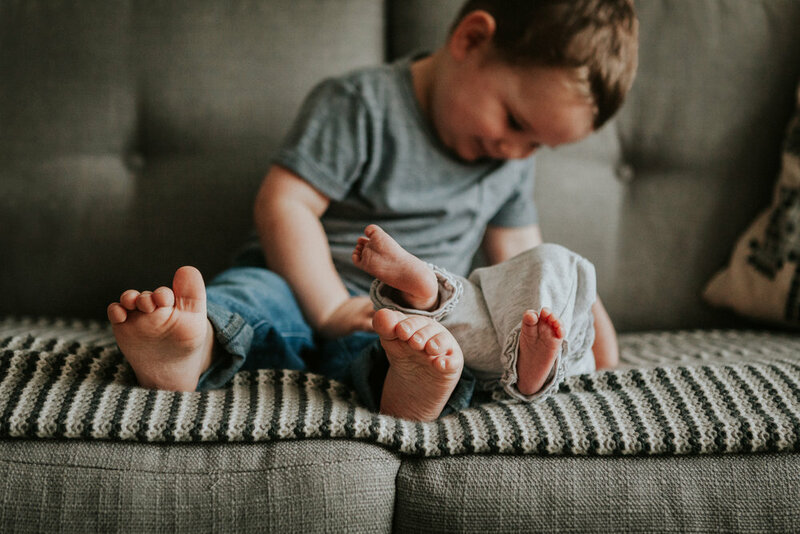 In my experience, I've found that siblings are much more likely to happily get involved when it's clear from the start that the session is about them, not just the baby. Of course they’ll be times when big brothers and sisters need a little break, or just some time away with mummy and so I will adapt the session to their needs. I will of course photograph your baby alone, but my approach is very natural and baby-led and so I won't place tiny, fragile bodies in awkward poses and if your baby just wants to be held (as many babies do) the focus can still be on them and their beautiful features. I take photographs from a variety of angles and perspectives, paying attention to light and mood and only place your baby in positions that are natural and comfortable for them. I won't place your baby in a basket or vegetable crate, or bring costumes and props, but I do welcome the inclusion of special blankets, toys or clothing that has importance to you!